As a fully accredited Qi test facility, UL offers comprehensive certification services for wireless charging devices seeking the use of the Qi logo. The latest advances of wireless charging deliver a whole host of benefits to consumers – but they also mean additional testing requirements for the manufacturer. Qi certification by an accredited laboratory is a mandatory requirement for devices wishing to use the Qi logo. UL is the only company in Japan accredited by the Wireless Power Consortium (WPC) to offer full Qi certification for wireless charging devices. Developed by Wireless Power Consortium (WPC), “Qi” is the international interoperability standard for wireless power transmission system with an electromagnetic induction system. Qi-certified products can be charged with any types of Qi-certified rechargers, irrespective of the manufacturers. Thus, it offers greater convenience for consumers who will no longer need to carry separate rechargers for each of their devices. In order for manufacturers to gain the use of the Qi logo, full certification must be undertaken, which includes both compliance and interoperability testing. 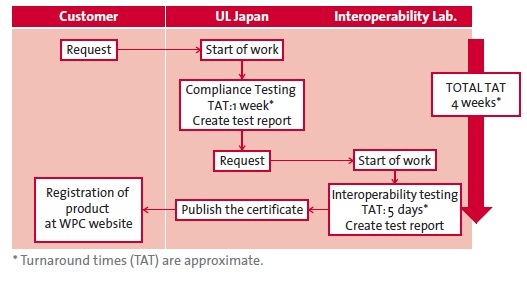 As a fully accredited laboratory UL Japan covers both, helping to make sure that products are fully compliant and market ready.